October is Autism Awareness Month in Canada and as it draws to an end I would like to say a few words about the Autism Society New Brunswick which is the only provincial voice for autism in New Brunswick. First, and foremost, ASNB is a democratic volunteer organization open to persons with an interest in autism in New Brunswick. General meetings of the ASNB membership are held at least 3 times a year in different locations around the province. Policy at ASNB is set by the board in consultation with membership; not by paid executive directors. The ASNB does not receive money from government to conduct its operations. When ASNB assists parents in discussions with government, education or health authorities it does so with no conflicting interest. It is not tied to government grants and it is not required to comply with government regulations or policies which tell it what it can and can not say to its members. Notwithstanding its fiercely independent voice, ASNB was recognized as the voice for the autism community by government by enactment of regulation 97-127 pursuant to the Mental Health Services Act. 1 This Regulation may be cited as the Mental Health Services Advisory Committee Regulation - Mental Health Services Act. "Committee" means the Mental Health Services Advisory Committee. The ASNB has been a key partner in the UNB Autism Steering Committee and has participated in such committees as the Dialogue on Education Committee and the Ministerial Committee on Inclusive Education. It also participated in the ad hoc committees that were struck to examine the continued provision of tertiary care services for autistic persons at the Stan Cassidy Centre. ASNB has helped raise public awareness of autism around the province purchasing books on autism and evidence based interventions for autism for the New Brunswick Public Library System, for community autism centres and for autism agencies. It has also been a key participant in the recent National Autism Strategy initiative advanced by Andy Scott and the students in Greg Peters Leo Hayes High School class. The biggest challenge confronted by parents of children newly diagnosed with autism is what to do about it; how can they help their children, what treatments should they seek to cure their child or at least improve their quality of life. ABA has been widely endorsed as being an evidence based effective intervention but it is complex and expensive. "Alternative" treatments abound as cheaper, easier alternatives, and parents can end up losing their valuable funds and even more valuable time - time which is critical for the their childrens' development - exploring unproven, ineffective, alternative treatments. When my son was diagnosed secretin was the flavor of the day. So too was vitamin B-12 treatment. Now a study by University of California at Davis professor and colleagues indicates that there is no benefit to B-12 treatment. SAN DIEGO, Oct. 30 -- Preliminary results of a small ongoing study of vitamin B12 injections for children with autism showed no signs of significant benefit, researchers reported here, but they remained hopeful. So said Lesley J. Deprey, Ph.D., of the University of California at Davis, and colleagues, in a poster presentation at the American Academy of Child and Adolescent Psychiatry meeting here. Their hope, they noted, derived from "anecdotal reports of remarkable clinical improvements" using subcutaneous vitamin B12 (methyl cobalamin), although there have been no supporting published studies. Vitamin B12 is an antioxidant involved in metabolism pathways for cellular methylation, which has been implicated in other neurological disorders like schizophrenia and Alzheimer's Disease. Social Communication Questionnaire verbal results (P=0.4211). A significant improvement found for nonverbal Social Communication Questionnaire scores in the vitamin B12 group compared to placebo (P=0.0309) disappeared after adjusting for multiple testing. 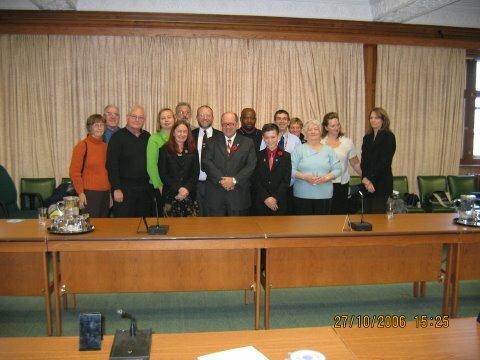 History was made Friday, October 27, 2006, with the debate on Fredericton MP Andy Scott's private member bill M-172 calling for a National Autism Strategy. Here are a couple of pics for the history books. Bottom: Andy Scott at a reception after the first hour of debate surrounded by supporters. Top: National autism advocate Andrew Kavchak and Dr. Sam Yassine father of 6 year old Amjad Yassine who was completely non verbal at the age of 4 but is now thriving and entering a regular school at age 6 - after two years of ABA therapy. 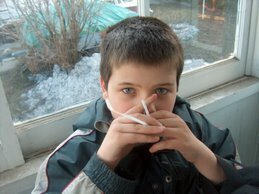 In the debate over education of autistic children it is difficult to impress upon professional educators that for some autistic children, who are very environment sensitive, the mainstream classroom is NOT the best learning environment, that for some the classroom is an overwhelming experience that can, as it did with my son Conor, result in self injurious behavior. Conor would come home from school with bite marks self inflicted from frustration. In Conor's case the local school and district officials cooperated and removed Conor to a quieter location where most of his learning takes place with occasional, well considered, and purposeful visits to the classroom for specific tasks and interaction with other students. Not all parents of autistic children receive such enlightened cooperation when it comes to their children. Some educators simply do not understand that autistic children are environmentally sensitive and can be overwhelmed to the point of self injury by too much stimulation or even change in their environment. This morning an innocuous event which illustrates my son's environment awareness and sensitivity occurred when he rose a bit early to use the bathroom. I lent my arm to him for support as he staggered to the bathroom. Groggy and half awake he entered the bathroom still staggering a bit when he spotted a hair brush with the bristles face down on the counter. Conor stopped to turn the brush over so that the bristles would face upward as they usually did. The smallest details of his environment do not escape his attention even half awake in the early morning while on his way to perform an urgent task. Health care providers are objecting to the presentation by David Kirby at a conference which began yesterday in Halifax. Kirby is the journalist and author of "Evidence of Harm" a book which purports to examine the debate between medical authorities and parents of autistic children who believe that the mercury based preservative thimerosal used in some vaccines is to blame for their childrens' autism. The theory of a causal link between thimerosal and autism has been soundly rejected by medical and scientific authorities but SOME parents do not accept those views and believe that there is a "Big Pharma" conspiracy to suppress evidence of the link - evidence of harm - as Kirby's book is titled. Kirby is accused by some authorities of stoking the fears of parents and contributing to a downswing in vaccinations thus causing a revival of serious, even deadly diseases, once thought vanquished by vaccination programs. Personally, I have never bought into the theory that vaccinations cause autism, but obviously further research could prove me wrong. As of right now the research literature does not support such a link. 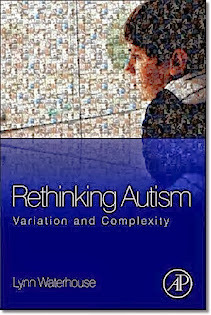 There is much research being done now into the causes of autism. Whatever the cause/causes of autism might be it is critically important that any conclusions we reach are based on careful scientific study and clear evidence derived from those studies. Fear should never be a substitute for careful study and analysis. That is the opinion of this parent. Joanne Langley, pediatric infectious disease specialist at the IWK, said the idea that thimerosal, an anti-bacteria preservative containing mercury found in some vaccines, could contribute to autism was raised about 15 years ago, but was later retracted. "There is now a huge body of evidence that shows there is no association between infant vaccines and autism," she said, adding that thimerosal has not been used in children's vaccines in Canada for 10 years. Langley also said it's important that parents know vaccines are safe and information to the contrary is "fear mongering" and could be dangerous. "If they're concerned and don't immunize their children, they are susceptible to those infectious diseases, which are very serious." The debate of Fredericton MP Andy Scott's national autism strategy private member's bill started today in the House of Commons and aired on CPAC. It was encouraging to see a lot of important information about autism, evidence based treatment, particularly ABA aired in the H of C. The Leo Hayes class of teacher Greg Peters was praised for the tremendous effort they have made on behalf of the autism cause nationally. It was also great to hear Andy read Fredericton area resident Brian Rimpilainen's letter about his autistic child and some of the realities of life for a family with an autistic child. It was tough to sit still as the Bloc Quebecois speakers squabbled about protecting Quebec's constitutional turf. It was difficult to say where the Conservatives were going with their comments. For many of us in New Brunswick who have fought for years for government funded evidence based pre-school treatment, autism trained TA's to work with autistic students, and decent residential care for autistic youths and adults it was nice to be able to sit back and let advocates like Andy Scott, Nova Scotia NDP MP Peter Stoffer and Brampton-Springdale (Ontario) Liberal MP Ruby Dhalla do the heavy hitting and educate Canadians about autism today in the House of Commons. Debate did not conclude today and I am informed by Andrew Holland, executive assistant to Andy Scott, that the debate and vote will probably be continued and concluded in either the 3rd or 4th week of November. I have been informed that the debate on the National Autism Strategy motion will now be heard at 2:30 PM Atlantic time. Fredericton MP Andy Scott is leading off the historic debate on a Nation Autism Strategy in the House of Commons tomorrow. In New Brunswick he has been assisted by Leo Hayes High School students in Mr. Greg Peter's class for two consecutive years. ASNB has also contributed much to the national campaign led by Luigi Rocca, Lila Barry, Nancy Blanchette, Dawn Bowie and Brian Rimpilainen. In Ottawa Andrew Kavchak has been an unrelenting advocate for a national autism strategy. 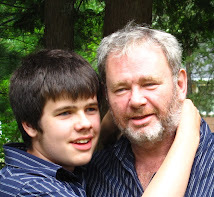 The following pictures and description can be found on the Canada Autism Petition page at http://canadaautism.com/Default.aspx?tabid=97 . 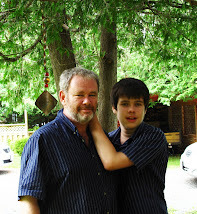 Andrew Kavchak is an Ottawa father of a boy who was diagnosed with autism in 2003. From March to November 2004 Andrew protested on Parliament Hill during his lunch hour breaks. Recently, on June 1, 2005 he recommenced his noon hour protest on the Hill. Andrew tries to lobby politicians and journalists as they walk by. He also engages in a lot of public education and asks visitors to the Hill to sign the autism treatment petition. On the eve of tomorrow's historic National Autism Strategy debate it is important to remember that such events do not spring up overnight. Here is Andy Scott speaking at a National Autism Strategy rally on April 24th. The Liberal MP for the Fredericton riding, Honourable Andy Scott will be presenting his Private Member's Motion tomorrow (Friday October 27th) in the House of Commons calling on the Government of Canada to create a national autism strategy. The purpose of this motion is to call on the Minister of Health and this government to collaborate with provincial and territorial Ministers of Health to create a national strategy ensuring that persons with autism spectrum disorders will receive treatment and therapy for their condition and the associated costs will be covered by the health care insurance plan of every province. The motion was a collaborative effort with people with autism, autism advocates, researchers and other professionals - and the Grade 12 political science class of Mr. Greg Peters at Leo Hayes High School in Fredericton who also brought in many authorities to discuss the issue and develop this motion. The first hour of debate will take place Friday afternoon at 1 p.m. Atlantic. M-172 — May 15, 2006 — Mr. Scott (Fredericton) — That, in the opinion of the House, the government should create a national strategy for autism spectrum disorder that would include: (a) the establishment, in cooperation with provincial governments, of national standards for the treatment of autism spectrum disorder and the delivery of related services; (b) the study, in cooperation with provincial governments, of the funding arrangements for the care of those with autism spectrum disorder, including the possibility of transferring federal funds to assist provincial governments to provide no-cost treatment, education, professional training and other required supports for Canadians with autism spectrum disorder without unreasonable wait times; (c) the creation of a national surveillance program for autism spectrum disorder to be managed by the Public Health Agency of Canada; and (d) the provision of funding for health research into treatments for autism spectrum disorder. Office of Hon. Andy Scott P.C.,M.P. Autism has been plagued by whacky theories about its causes and treatments. Almost every thing imaginable has been offered to desperate parents as a cure or treatment for autism. The classic example of a whacky autism treatment is the "swimming with dolphins" treatment which has otherwise rational people spending money and placing their children in the water with dolphins in the hopes that the interaction would stimulate development in their autistic child. That particular therapy has now morphed into the "touching beluga whales" treatment offered in China. Touching, feeding and training Beluga whales is helping 16 children suffering from autism in northeast China. The children, all under 10 years of age are working with the whales at the Polarland Aquarium in Harbin, capital of Heilongjiang province. Experts said that the sounds by beluga whales can help to treat infantile autism by stimulating thee children's nerve cells, which will be more effective when the children make direct contacts with the animals. After a 20-day course of treatment the children are given medicines and get supportive therapy. Dolphins have been used in other parts of the world to help stimulate children with autism, experts said. 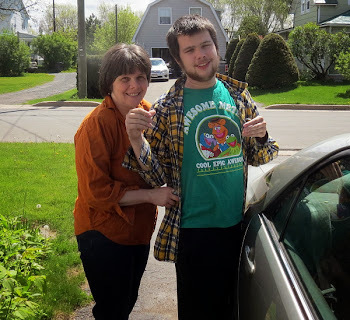 I have been informed by Fredericton MP Andy Scott's office that the debate on Andy's private member bill asking the government to implement a National Autism Strategy will take place at 1 PM Atlantic time this Friday October 27 2006 and will be seen on CPAC at that time. Another study has found that the MMR vaccine is not a causal or contributing factor to development of autism. The most recent study to clear the MMR vaccine may or may not have an impact on those who believe that the MMR causes autism. But here is an article on the latest study and some further links. A new MUHC study provides conclusive evidence that the Measles Mumps Rubella (MMR) vaccine is not associated with the development of autism spectrum disorders (ASDs). The study, published in the scientific journal Pediatrics, also reveals fundamental errors in previous molecular studies that falsely implicated the MMR vaccine as a risk factor for autism. This study was funded by the Crohn's and Colitis Foundation of Canada and the Fonds de Recherche en Sante du Quebec. Research Institute of the McGill University Health Centre (RI MUHC) is a world-renowned biomedical and health-care hospital research centre. Located in Montreal, Quebec, the institute is the research arm of the MUHC, a university health center affiliated with the Faculty of Medicine at McGill University. The institute supports over 500 researchers, nearly 1000 graduate and post-doctoral students and operates more than 300 laboratories devoted to a broad spectrum of fundamental and clinical research. The Research Institute operates at the forefront of knowledge, innovation and technology and is inextricably linked to the clinical programs of the MUHC, ensuring that patients benefit directly from the latest research-based knowledge. For further details visit: http://www.muhc.ca/research. The McGill University Health Centre (MUHC) is a comprehensive academic health institution with an international reputation for excellence in clinical programs, research and teaching. The MUHC is a merger of five teaching hospitals affiliated with the Faculty of Medicine at McGill University--the Montreal Children's, Montreal General, Royal Victoria, and Montreal Neurological Hospitals, as well as the Montreal Chest Institute. Building on the tradition of medical leadership of the founding hospitals, the goal of the MUHC is to provide patient care based on the most advanced knowledge in the health care field, and to contribute to the development of new knowledge. the gov't is saying our son is not "severe enough" to get services. potential. So sad and frustrating!!!!!?" Families moving to Alberta because of the province's heralded services for autistic children are discovering a shortage of frontline staff is preventing their children from getting help. Workers have been lured from community agencies that work with autistic children by higher paying and less stressful jobs available thanks to the province's economic boom. Those agencies are now facing a staffing crisis, said Anne Hughson, an associate professor in the disability studies department at the University of Calgary. "When agencies are desperate, they start to maybe reduce their qualifications, or their credentials, or maybe even standards that they have for hiring people," she said. 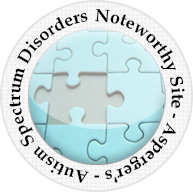 Autism, or autistic spectrum disorder, is a neuropsychiatric disorder that impairs a person's ability to communicate and interact with others. It is estimated to affect between two and six children in every 1,000. Alberta pays up to $60,000 annually per qualifying child up to age 18 — and anyone who comes to the province can apply. That's prompted families to pick up and move to Alberta. Some families with autistic children who have lived in the province for years have expressed concerns that the influx is straining the system. 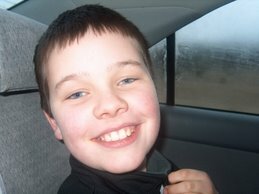 The Londons came to Calgary from New Brunswick a year after Mitchell was diagnosed with autism. "When we first came here we thought, wow, we've got all this funding," said his mother Miriam London. "But now we're beginning to realize … it's very difficult for you to get these services out in the community because there's … not enough people that are filling these positions." Mitchell is now in Grade 1. 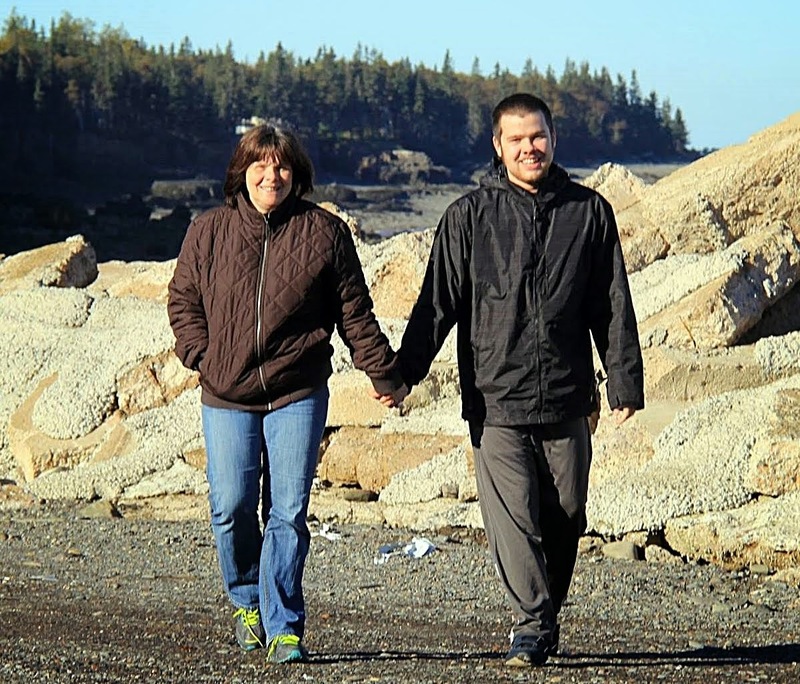 His parents struggled to find someone to do one-on-one therapy with him after school, going so far as to distribute recruitment flyers for Autism Partnership, the agency that works with her son. The Londons eventually found a psychology student at the University of Calgary who was willing to work with Mitchell. Children's Services Minister Heather Forsyth said over the last two years the province has provided social agencies with $14 million to boost salaries so they could hold on to frontline workers. She applauded the Londons for taking the matter into their own hands. "Good for them," she said. "That's not only government's responsibility, that's somebody that has taken action within the community and gone out aggressively and found a worker." The University of Calgary's Hughson said the province needs to do more. "Yes, it is true there have been increases in budgets to allow for improvement in staff salaries, but we're talking about an erosion that's gone on for nine or 10 years with a Conservative government," said Hughson. "[They] are only slowly now beginning to make up for that." In a previous post I commented on the gap between the rhetoric and the reality of mainstream classroom inclusion for all children including autistic children. The emphasis on putting all children together in the mainstream classroom is based on the belief, unsupported by evidence, that all children benefit from being placed full time in a mainstream classroom. Some autistic children are overwhelmed by the stimulation of the mainstream classroom resulting in some cases in self aggression, disruptive behavior and failure to learn. Governments like mainstream inclusion for a number of reasons. Inclusion is such an appealing concept it is easy to sell to parents. Mainstream classroom inclusion is cheap, much cheaper than providing separate locations and specialized assistance for those children for whom alternatives work better. When the MacKay review was commissioned it was assumed that inclusion works and that some minor tinkering was all that was required to keep it running smoothly. The MacKay review terms of reference did not ask whether inclusion works for all. Because it was based on the premise that inclusion is wonderful the MacKay review did not ask whether alternatives to the inclusion model might work better for students, parents and educators. The MacKay review did not ask whether some children, including some autistic children, have actually suffered from being placed full time in a mainstream classroom. The MacKay review did not ask these difficult questions. The Inclusion Summit which followed the issuance of the MacKay Report on Inclusive Education was organized to prevent discussion of these important questions. It was organized to prevent discussion of issues affecting children with particular disabilities such as autism. Autism representatives were told at the outset that we would not be permitted to discuss specific disabilities; that the discussion would focus on general themes. In the first workshop that I attended I was actively discouraged from asking these difficult questions by one of the government participants who informed me that "you people should be thankful for what you've got". At another session when I tried to talk about the need to provide autism specific training to Teachers' Assistants who work with autistic children I was told by a School District Superintendent to "get serious". As the second day of the summit was rapping up a press conference had been scheduled at which a summary of the summit was provided at a press conference before the the summit had even ended. The process of ignoring dissent, of painting a pretty picture of inclusion in NB schools and ensuring that the difficult questions are not asked continues today. In November the Department of Education and the New Brunswick Association for Community Living will co-host a two day professional development event for New Brunswick teachers. The NBACL has done a lot of good work improving the lives of all persons with disabilities and their work is appreciated but they have consistently promoted the philosophy that all children benefit from being placed in a mainstream classroom. This belief is not supported by evidence or study and in practice has hurt some children including my own severely autistic son. ASNB requested the opportunity to address the teachers at this event but that request was rejected by the Department of Education and the NBACL. The event was planned entirely by the Department and the NBACL and the list of speakers and topics reflects their jointly held beliefs in mainstream classroom inclusion for all students. The questions that were not asked during the Mackay Inclusion summit will not be asked in discussion with the teachers of NB. Dissenting voices will not be permitted to be heard by the teachers who form the backbone of the NB Education system. The ASNB evidence based approach that NOT all children should be placed in a mainstream classroo, that there should be flexibility in placement and that a child should learn in a setting where they learn best, by the methods that work best for that child, will not be heard by NB teachers. The MacKay review process consumed a lot of time, money and human resources but it did not include a critical review of the current system. The old system with all its flaws is still being promoted at important events such as the professional development days for NB teachers. An opportunity to truly rethink, re-examine and improve NB's approach to inclusive education may well have been lost for another generation of students. ABA - Cruel and Abusive? 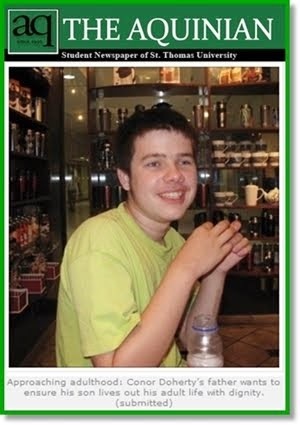 Conor on the Green "Step"
Opponents of ABA - Applied Behavioural Analysis - as a health and education intervention for autistic children will sometimes chacterize ABA as a form of abuse, a form of cruelty inflicted on autistic children. Such criticism is without any merit. It is not based on first hand experience of ABA as it is practiced today by competent ABA therapists. Right now my son Conor has been sitting outside on the green deck or "step" as he calls it, under a roof, on a rainy day, waiting for his ABA therapist to arrive. He has been there for 15 minutes and it will be another 20 minutes before his therapist arrives. But Conor is waiting in anticipation for his ABA therapist and he is waiting in anticipation of doing his ABA therapy. He does so because ABA as it is practiced today can be fun. It is something Conor looks forward to and enjoys. ABA - cruel and abusive? Not even close. The ASNB AGM was held yesterday and it was a great day! Andy Scott was our guest speaker and he filled us in on the National Autism Strategy and his private member's motion scheduled to be debated in Parliament on October 27, 2006. With his expertise in federal government, his speaking skills and his passion for the autism cause it made for an outstanding presentation. Many thanks to Andy Scott and his communications officer Andrew Holland who also attended. Andy also brought with him two students from the Leo Hayes High School political science class that has been assisting Andy on the National Autism Strategy last year, and with new students, this year. These young people have done a lot of hard work on behalf of the NAS including extensive letter writing campaigns. I met with the first group in the class last year and they are well informed about autism and public policy making. It is very heartening to see young people so actively involved. There were some changes on the ASNB Board. 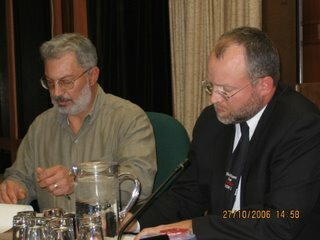 Long time ASNB board member Jason Oldford did not reoffer this year. 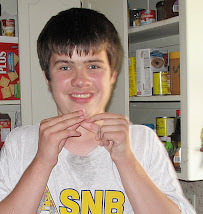 Jason has been a key part of ASNB and the autism community in New Brunswick for several years. 9) Purchasing books on evidence based interventions for autism for distribution to community autism centres, autism intervention agencies and the NB Public Library System. The Autism Society New Brunswick is the provincial voice for the autism community in NB. It is a volunteer based organization and it is not financed by government. This allows ASNB to speak frankly to government in our discussions about autism and the issues and conditions affecting autistic persons in New Brunswick. 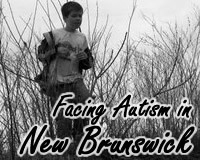 If you are interested in becoming involved do not hesitate to contact me at my email address for this blog site or contact the ASNB web site at http://www.autismnb.org/ for email and telephone contact coordinates. While the advocates of mainstream classroom inclusion for all students have ruled the roost in New Brunswick in recent decades parents of autistic children in Mayo County Ireland are looking in a different direction. They are seeking an autism specific school where there children can receive a real education using the Applied Behavioural Analysis techniques which have proven effective in treating and educating autistic children. MAYO is hoping to be home to a new autism specific school and one group of parents is determined to get the project off the ground. A group of Mayo parents with children affected by autism have held several meetings within the county with a view to putting a proposal to Minister for Education, Mary Hanafin. The group are currently working to raise awareness on the benefits of autism specific schools and particularly on Applied Behaviour Analysis. Applied Behavioural Analysis or ABA, is the methodology based on the well-researched principles of operant and respondent conditioning. A key focus in ABA is to change behaviour and increase communication by using two components: teaching (utilizing Discrete Trial Training or DTT) and behaviour modification. By utilizing repetition and ongoing evaluation of student performance, complex tasks can be learned in a simple step-by-step manner. An autism specific school in Mayo would emulate other schools of its kind throughout the country such as The Red Door in Dublin or Saplings School, Kill, Kildare. ABA schools have a 47 per cent success rate in mainstreaming children with autism and this reflects the success of the ABA system." I had promised my last update about the Autism Society NB AGM on Saturday to be the final notice. However, since then Andy Scott, MP, Fredericton has agreed to speak at the AGM about the National Autism Strategy that Andy has been fighting for in Ottawa. Andy will be there at 1 pm. Again the meeting starts at 1 at Tilly Hall, Room 5, UNB Fredericton Campus this Saturday, October 14, 2006. Just one more notice - the ASNB Annual General Meeting is this Saturday, October 14 from 1 to 4, in Tilley Hall, Room 5, UNB Campus, Fredericton. If you are interested in issues pertaining to pre-school autism intervention, education of autistic students and adult residential care you should plan to attend this Saturday. Some of the same issues that we face in seeking to educate autistic students in New Brunswick schools are also being faced in the United Kingdom where classroom inclusion has also been substituted for inclusion in a real learning experience. In the UK autistic children are not taught using the techniques necessary for them to learn. We are still fighting that battle in New Brunswick and we will keep an eye on what happens in the UK. "Ruth McNichol, whose son George has Asperger's syndrome, told BBC News teachers needed to be trained to deal with autistic children. "There appears to be a lot of ignorance about autism and the particular education techniques that are required to teach children with autism. "It is particularly bad when children make the transition from primary to secondary school. Ms McNichol said when her son had started secondary school "he was bullied, he withdrew from lessons in the classroom and the staff didn't appear to know how to engage with him". "At the end of his first year at secondary school, despite not being in any way disruptive, he started self-harming and he was obviously in a great deal of distress," she said." On October 27 2006 a Private Member's motion by Fredericton MP Andy Scott, M-172, will be debated in the House of Commons. The Motion, as Andy's letter soliciting support from other MP's sets out below, calls on the federal government to develop a National Autism Strategy. Andy has had the help of an amazing group of students from Leo Hayes High School in Fredericton led by teacher Greg Peters. I had the privilege of talking to them last year for about an hour. The hour flew by quickly, filled with well informed, insightful questions. Autism advocates Brian Rimpilainen, Lila Barry and Dawn Bowie, have also worked hard at making this happen. The motion debate will be broadcast on the CPAC channel on October 27 2006. Let's keep our fingers crossed and wish for success on October 27, 2006. And whatever happens a big thank you to Andy Scott, his office staff, Greg Peters and his students at Leo Hayes High School , Brian Rimpilainen, Lila Barry and Dawn Bowie. I am contacting you in reference to my Private Member’s Motion M-172 calling on the House of Commons to ask the Government of Canada to develop a National Strategy on Autism Spectrum Disorder. In advance of the debate early in this fall session, I ask that you please take a moment and review the attached letter from students and teachers at Leo Hayes High School in Fredericton. They have consulted extensively with autism treatment advocates, legal authorities and myself to help craft the contents of this motion. As you know, children with autism are not covered under the Canada Health Act. As a result, it is up to each province and territory to determine the level and extent of care that they will receive. In Alberta, care is provided to those individuals up to 18 years old. During the past couple of years, I have heard many stories of families leaving parts of the country, including here in New Brunswick, to go to Alberta and seek the appropriate care for their children. Quite frankly, parents shouldn’t have to do that in this country. A national strategy would help ensure that persons with autism spectrum disorders will receive treatment and therapy for their condition and the associated costs will be covered by the provincial and territorial health care insurance plans. 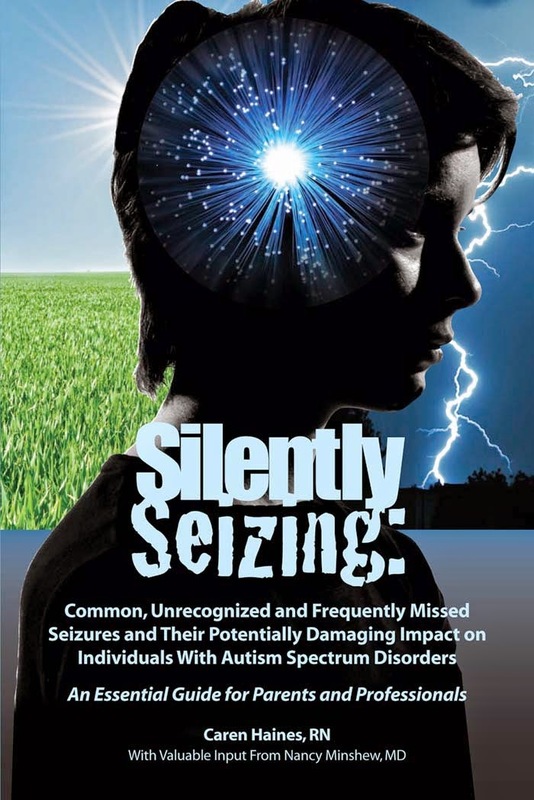 One child in one hundred and sixty-six now born will be afflicted with Autism Spectrum Disorder and that number is increasing at an alarming rate. Studies have repeatedly shown that Applied Behavioural Analysis, Intensive Behavioural Intervention and other treatments can dramatically improve the social and intellectual functioning of autistic children and thereby their quality of life. The enormously debilitating intellectual and social cost to the sufferer is rivaled only with the financial and emotional burden of care on their families. Therefore, a strategy would be a great thing to help make practical investments early in a child’s life in providing necessary interventions that will save money in the long run. I believe the Government of Canada has an important role it can play to facilitate such an important initiative. I ask that for your support of M-172 and please reply to these high school students who should be commended for being so enthusiastically engaged in public policy development. In New Brunswick graduates of the UNB-College of Extended Learning are starting to fill positions as TA's working with autistic students. With the new Liberal government pledge to provide more autism training for TA's and Resource Mentors each year for the next 4 years the pieces are in place for autistic students to receive a real education. ASNB, which helped establish the UNB-CEL autism program is confident that the AIT training is exactly what is needed to enable autistic student to receive a real education and not simply be subjected to a baby sitting exercise throughout their school attendance. It looks like clear sailing right? Well, yes .... and no. Even once an autism trained TA is assigned to work with an autistic child some NB School Districts, including Districts 14, 17 and 18, refuse to let the autism trained TA work the full school week with the autistic student. Instead the autistic student must spend approximately 25% of their day with another TA, usually one without autism training. 25% of the autistic student's day is at risk of being wasted, and in some cases, of having the good work done by the autism trained TA undone by the efforts of a TA with no autism training or knowledge. Some of the school districts insist that another TA, even if that person has no autism training or knowledge, be brought in to work with the student for parts of the school day to ensure that the autism trained TA does not surpass 25 hours a week. Thus, a severely autistic child who can learn only by the specialized methods taught at the UNB-CEL program, who has access to a UNB-CEL autism trained TA will not be permitted to work with that TA for more than 25 hours a week. The best interests of the autistic student in that situation are set aside in obedience to the 25 hour cap imposed by these districts. The cap is imposed by the districts in order to ensure that the TA's do not acquire status as employees under their collective agreement and under the Public Service Labour Relations Act. While the Department of Education suggests the cap as a guideline to the districts some districts impose the guideline without any exception and without taking into account the individual child's best interests. Even a severely autistic child who learns by the ABA or behavioural learning techniques must spend a part of the day with an untrained TA with no training or knowledge of ABA. 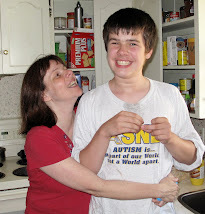 My own son is severely autistic and learns via an ABA based curriculum and methods. This year he has an autism trained and experienced TA with him for most of the day. She is excellent. 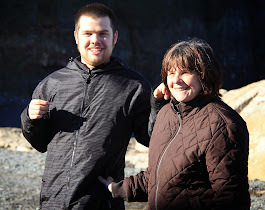 But if we want to keep him in school after 2:00, until 3:10 like his peers, his autism trained TA can not remain and work with him notwithstanding the investment the province has already made in her training and notwithstanding that her skills are needed in order for my son to learn. The District has refused our request to extend the hours of my son's autism trained TA so that she can spend the full day with our son. They have informed us that they do not wish to set a precedent and if we do not like it we should appeal. At the school level teachers and principals have always been helpful and focussed their efforts on our son's best interests. At the district level though the educators are replaced by administrators more interested in protecting arbitrary salary cap rules than acting in the best interests of each child. Although I am a lawyer by profession I do not like to be involved in legal appeals pertaining to my son's education. I prefer to work with the educators to whom we entrust our son's education and development. We have tried to work within the limits dictated by necessity and we have enjoyed a positive relationship with the school officials with whom we have worked. Now, with a district level issue involved, we must deal with an inflexible district policy. We are told we must appeal. We have requested an appeal under the Education Act. Unfortunately under that Act the appeal is to ........ the District which imposes the inflexible 25 hour cap. Any predictions on the outcome of our appeal? Congratulations on being named Minister of Education in the new cabinet. Your appointment will undoubtedly be well received by parents and educators. Now that you have had a couple of hours to get settled in I hope you do not think it too pushy if I remind you, as the parent of an autistic 10 year old boy, of Premier Graham's commitment to provide UNB-CEL Autism Intervention Training to Teachers' Assistants and Resource Teachers, for a total of 100 per year, for the next four years. The course will be commencing again on April 1, 2007 and this training is badly needed.